An electrical electrical distribution system is a series of electrical circuits that delivers power in the proper proportion to homes, commercial businesses and industrial facilities. 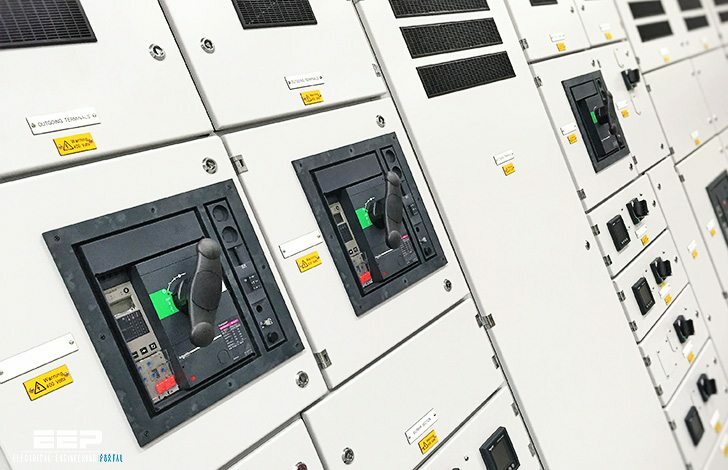 Regardless of the size and applications, the ultimate goal remains universal: the economic and safe delivery of adequate electric power to electrical equipment. In general, there are three types of distribution systems: radial, loop and network. The type used by the utility company depends on the services required, location and economics. The Radial Distribution System has one power source for a group of customers. If there is a power failure, the entire group loses power. In addition, a circuit failure somewhere in the system could mean a power interruption for the entire system. The Loop Distribution System loops through the service area and returns to the point of origin. The strategic placement of switches permits the electric company to supply power to customers from either direction. If one power source fails, switches are opened or closed to obtain power source. The Network Distribution System is the most expensive, and the most reliable in terms of continuity of service. This system consists of a number of interconnecting circuits operating at the same utilization voltage. The customer is connected to two or more power supplies. If one power source fails, the customer gets power from the other sources, without interruption. thanks for providing knowledge base all electrical engineers . This is an interesting article but more on industry environment. For distribution utility though principle remains same the challenge often is addition and extension that if not captured and updated in information base can lead to several issues on PQ front. Be it unbalance or low voltage etc. An article to address utility engineers on this aspect would be great value. Also this is Series 3 of learning module, can all the modules be listed and hyper linked for reading at one’s own leisure.